Yesterday we finished up planting the early seeds in the garden. While Vince tilled up an area where we’ll plant tomatoes, peppers, eggplant and squash, I planted seeds – collards, brussels sprouts, lettuce, kale and beets. 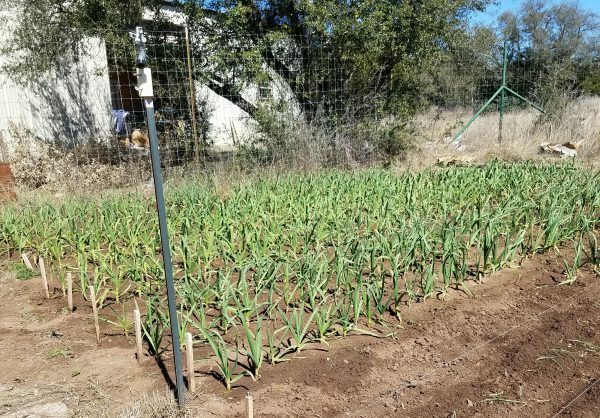 The garlic doesn’t look much different from how it looked a month ago. I was sure it would have scapes by now. I’m kinda planning my next trip to MO around the garlic and it isn’t cooperating! We have all the plants we need to plant except for maybe a few more artichokes. I have six in the greenhouse that I started from seeds but I’d like to have at least 10 plants so I’m hoping the plant people get a few more in. It’s still in the 30’s at night this week. Timing is everything . . everywhere with gardens but here, it will be so hot before long and we need to get things planted and harvested before the dreadful heat moves in. But, we wait . . because there’s no use planting tender plants while it’s still below 40 at night. I seem to remember advice that “ugly” artichokes are good ones, because they get that way when they get chilled and that concentrates the flavor, or something like that. Just saying that the artichokes might be among the hardier vegetables, better able to withstand cold (not freezing) temperatures. Wow, you normally get scapes this early in the season?!? I need to move to a warmer climate, LOL!! Here in the northeast, the garlic in my little community garden plot are still just shoots and we won’t see scapes until May or early June. But you do remind me I need to get moving on putting the cold weather crop seeds in the ground. I also hope all the really bad cold weather that has happened across the country this winter doesn’t presage similar weather for the Spring and Summer growing seasons. It’s usually in April when I get scapes but up until the last few weeks, we had so many 80 degree days, I was sure they would be early but I think the couple of weeks of really cold temps slowed them down. I should have them by mid-April. Please show the scapes when they appear as I have no idea what that is. Thanks. I never even thought to plant artichokes. I’m going to have to try that. Also I don’t grow garlic as I use it to cook with but buy it in jars already diced. My boyfriend likes it roasted whole so I’ll have to add that to my list today. My youngest is 9 and he has already declared half my garden space as his. He is my worker kid so he will definitely help with garden but I doubt he will be doing half the work and thus justifying is claim of half the garden. He eats tomatoes like it is candy and I told him he can grow as many tomatoes as he wants. The local high school FFA has their plant sale on the 30th so I have till then to get my beds ready. You have to be there when they open to get the veggies. I got distracted by the flowers the first time I went and turned around the veggies transplants were almost gone. The prices can’t be beat!